PROVO — Each year, 15 million babies are born preterm — before they’ve had a chance to fully develop inside their mother’s womb. Of those 15 million, nearly 1 million die due to related complications, making preterm birth the leading cause of death for children 5 and under. Yet, with all the advancements made in medicine, the first symptoms of preterm birth are the contractions. According to BYU chemistry professor Adam Woolley, a pregnant woman cannot know if she will give birth early until she goes into labor. “At that point, you’re managing the outcome instead of trying to prepare for it,” Woolley said. 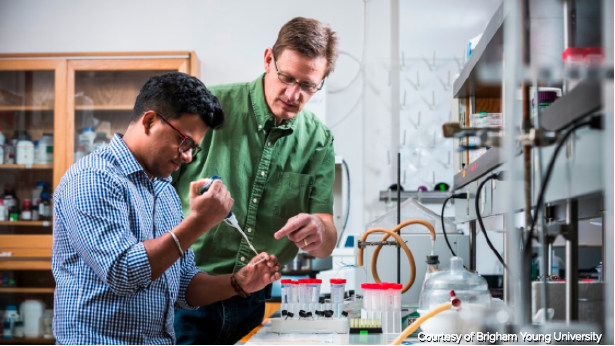 To help women prevent rather than simply treat preterm birth, Woolley and BYU chemistry Ph.D. student Mukul Sonker have created a small chip (an integrated microfluidic device) that will predict with 90 percent accuracy a woman’s risk for preterm birth. “It’s like we’re shrinking a whole laboratory and fitting it into one small microchip,” Sonker said in a news release. Sonker and Woolley co-authored the study, which was recently published in Electrophoresis and funded in part by the National Institutes of Health. To read the full article on KSL, click here.